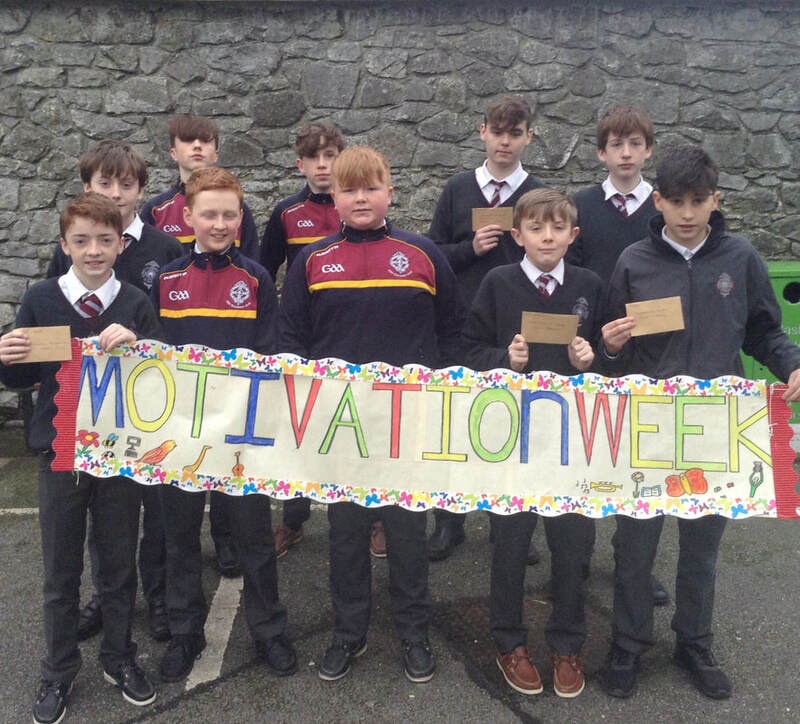 Motivation Week 2018 in CBS Kilkenny runs from Jan 22-26 2018. Quotes box located in the front hall. class will receive a prize. 4) ‘My Happy Place’ Photo Competition. Creates a positive school atmosphere. Creates a caring school environment which is supportive and inclusive. A vehicle for student participation. Beneficial impact on issues such as discipline, bullying and Staff-Student relations. Creates educational opportunities for students. Provides an interactive learning environment. Students can develop communication and leadership skills, responsibility and accountability. To acknowledge and promote the Catholic ethos of the school.On the 24th of October 2017, the Student Council was visited by Pat Murphy who is a retired teacher from Dublin who currently travels the country and gives workshops to Student Councils in schools. He began by giving us different sheets of information concerning the running of the Student Council at meetings and possible events we could hold through the upcoming year such as cake sales, anti-bullying days and school quizzes. He also asked members to volunteer for some of the main positions in the Student Council such as Chairperson, Secretary, Treasurer and Public Relations Team. He then told us stories of past experiences with different student councils. Overall it was very interesting and the team thoroughly enjoyed it. Pat gave us many tips and tricks which will further help the Student Council for the upcoming year. The highly anticipated student council election was held, this year, on the 9th of October in the GP Room. TY students assisted on the day to ensure everyone got their vote. This year in particular was an important one for all of us. The expansion of the council, spearheaded by Ms. Nolan Kennedy, meant, not only that more students could apply to join the council, but also that everyone had a more diverse choice of candidates in the election. In the end, a total of 16 students were elected to the council as representatives of their respective years. 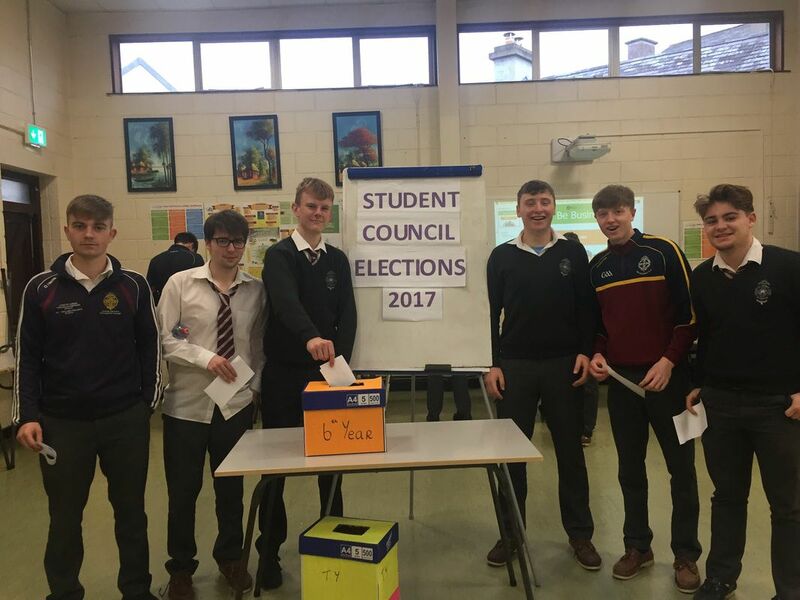 Who are we?The Student Council at CBS Kilkenny is a body of Students who look after the needs of all students in the school. It provides Students with the opportunity to become involved in the affairs of the school, working in partnership with school management, staff and parents. It always works for the benefit of the school and its students. The following students were elected to the Student Council for the academic year 2017 - 2018. 6th year -Ryan Nugent, James Bourke and Michael O' Brien. 5th year -Finnian Breen, Shane O'Loughlin and Ben Prizeman. 4th year -Luke Cullen, Conor MCarthy, Eoin Maguire and Simon Kleina. 3rd year -Jaolo Maralit and Cillian Murphy. 2nd year -Michael Brennan and Evan O'Hara. 1st year -Ritvick Trehan and Michael Clarke. At the first meeting of the Student Council the following officers were elected. 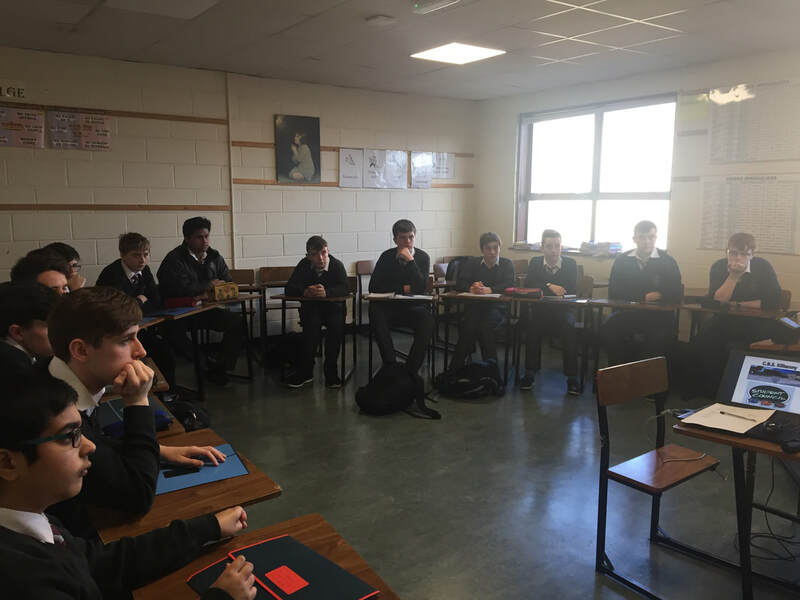 ​On the 24th of October 2017, the Student Council was visited by Pat Murphy who is a retired teacher from Dublin who currently travels the country and gives workshops to Student Councils in schools. He began by giving us different sheets of information concerning the running of the Student Council at meetings and possible events we could hold through the upcoming year such as cake sales, anti-bullying days and school quizzes. He also asked members to volunteer for some of the main positions in the Student Council such as Chairperson, Secretary, Treasurer and Public Relations Team. He then told us stories of past experiences with different student councils. Overall it was very interesting and the team thoroughly enjoyed it. Pat gave us many tips and tricks which will further help the Student Council for the upcoming year. On Monday 13th November, the Student Council held their 2nd official meeting and were presented with their badges by the principal, Mr. Clarke. During the presentation, the Council was reminded of it’s responsibilities and was thanked for deciding to bear the responsibilities of the Student Council. On Monday December 18th, we held our annual Festive Treats Sale. This year’s Student Council decided that all proceeds should be given to Teach Tom, who provide ongoing counselling and support for suicide awareness in the community. We would like to sincerely thank all our sponsors: SuperValu Market Cross, Stephan’s Pretzels, Slice Of Heaven, Sycamore Stores, Aldi Loughboy, Design Centre, Gourmet Store, Mug Shot, Keogh’s and The Pennefeather Cafe. We raised €221.65. All leftovers from the bake sale were donated to The Good Shepherd Centre who were very appreciative. The Student Council thank you for all your support. 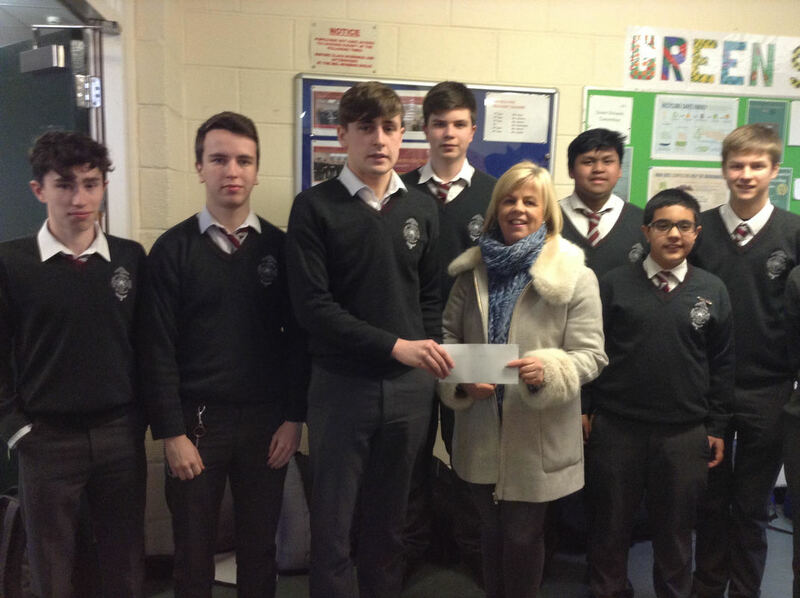 ​The Student Council presenting a cheque to Angela Hayes from Teac Tom.The Student Council organised a recent fundraiser for this very worthy charity. Thanks to all for their support. Congratulations to the prizewinners of the competitions that were organised for Motivation Week 2018. Congratulations to the First Years who were the prizewinners for the pedometer challenge that was organised for motivation week 2018.